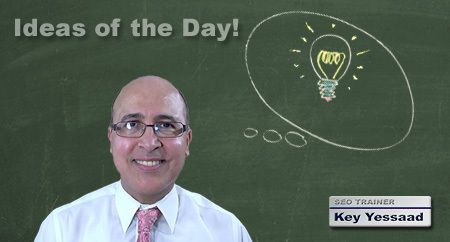 June 2012 Ideas, Thoughts, and Real Estate Business Facts of the Day written by Key Yessaad. This ongoing conversation is being nurtured with the expressed vision of nudging Real Estate Agents into the ‘doing’ mode of their daily business – Not just the learning and the routine mode. The source of Key’s writing is grounded in his Real Estate Trainings, Business Coaching, Internet Marketing background, and SEO Strategies developed over 3 decades of teaching and business management. I hope you are enjoying the series; if you wish to ask key a question go ahead. "Ponder this easy question: What is it that you are doing now that you have classified as Hard Work? Is it hard work because you are in the middle of doing it and wishing you were doing something else? or is it hard work because you anticipated it to be ‘hard work’ before you started accomplishing and doing the work? Let’s push the question even further: When was the last time you did ‘Hard Work’ yet did not care, nor complained about it – in fact found yourself adding tremendous value to others, and enriching a deeper meaning about who you are?" "You have to come to terms with the reality that it is highly unlikely that you will be able to act or respond to every inquiry, email, phone request, or to-do on your list. As Real Estate Professionals a good chunk of you day belongs to the whims of your clients, as it should be. Your job is make better choices and not let your head become your filing cabinet, your job is to gather your thoughts on a daily and weekly basis and prioritize your activities. 15 minutes of silence a day, away from everyone, away from everything, just on your own, will bring that sharp clarity back to the center of your sanity!" "You know those emails that are sitting in your inbox that you are in limbo about, you know you keep them in the inbox because you want to remember to act on them so you do not move them to another folder, yet you did not set an action in your calendar because you are too busy. Those emails drain your energy because they keep your mind occupied and in two limbo states at one: On one hand you must remember to act on them; on the other you do not want to look them because you are too busy with your business. Stop this madness, it is draining you!" "Face Time in the Real Estate Business is crucial in all your dealings with Buyers, Sellers, Investors, even for you Brokers with your own Agents. But Face Time is no longer reduced to actual physical meetings - face time can mean video conferencing using apps within your Smartphones, Tablets, Laptops, Computers, etc… Most devices now come with built-in Web Cams, and even it they don’t you can get a Webcam cheaper now than ever before – so go on, hold some face time with your clients; the body language and the voice interactions will add depth to your transactions." "The biggest conundrum about not knowing what you are doing stems from the realization that you won’t know when to stop; this simple idea illuminates the need of understanding the tasks you are trying to accomplish or you will find yourself working on being busy, rather than accomplishing the necessary steps towards a successful career." "True knowing is never grounded in intellectual knowledge only; those who truly know are connected to their knowledge experientially. Learning Real Estate SEO and Internet Marketing is not just learning a series of techniques, it is about putting into practice that which you have learned. Writers write; Bloggers blog; and Realtors prospect." "Is Real Estate your ideal job or are you dabbling in it while pursuing another career? There was a time when being a ‘Weekend or Summer Real Estate Agent’ was sufficient and viewed as equal to those who live and die by earning a commission full time. The Internet has changed that; taking listings and offering exemplary marketing requires more dedication and resources; interacting with customers’ inquiries is instantaneous – none of that I will call you after my ‘real’ job and work on your file; in fact when surveying sellers and buyers they all said they wanted to know the Full Time Status of the Real Estate Agent they were working with. If you are choosing to be part time in Real Estate, design a year plan that will gradually move you into this career full time; it will be very hard for you to gather enough momentum to earn a great living as an agent unless you choose Real Estate as your career." "Real Estate Agents have angst; in fact to be a successful Real Estate Professional is to have those annoying worries that creep up when you are trying to go to sleep. You will know that you need to deal with these aggravations when you find yourself working hard on other projects to avoid thinking about these looming problems. Unfortunately your mind will not wall you off from your angst, and the best thing you can do is to confront your demons; you will at some point anyway – why not do it sooner and be able to return yourself to your center." "Have you ever noticed that working hard on the right project does not feel like hard work; you become consumed by the process and you get in your zone. When we fight what we do it becomes hard work; some of you may be struggling financially to get to the next paycheck, and it feels tough to just wake up. Call a friend and let them know how you feel and extricate that angst out of the way; then go to work on tasks that bring clients, and focus on taking care of them – the check is just around the corner, so keep trusting in yourself." "Those who fear making mistakes, or worse, what others will think of them tend to have a hard time excelling in Real Estate. The heart of the Real Estate Business is interacting with people and asking them for business, and yes some of them have already made up an opinion about you – but you can’t change that; what you can do is be good at what you do. So go out there and prospect and make mistakes – getting 9 No’s for 1 Yes are stats I will take every single day!" "The river of your life has its own momentum and energy; you will not be able to stop its flow, or to pretend that you are starting brand new with no past. Yet you can start directing yourself properly by flowing with it and inching your way, little by little, towards a higher self and connected intention. Resistance to your life’s flow causes you more pain than your acceptance of it." "Whether you are an organization of 1 or of 100 people, you must spend no less than 60% of your time getting and keeping customers. Real Estate Brokerages that do not track the hours of effort, and assess that the majority of that time is spent on ‘Direct Prospecting’ end up becoming desperate for leads and wasting more resources and money than those who are methodical about time spent on job 1: Getting Clients." "Setting High Expectations for Excellence does not contradict your desire for ‘being there’ to those you love and wish to nurture; they go hand in hand and nourish each other. Making money is never an expectation, it is always a result of a determined career focused on being good at one’s job. Doing good work must find a way of transcending the rewards of paychecks or commissions – doing good work with High Expectations is worth waking up for in the morning." "It is tempting to rationalize that all administrative tasks in your business must be done by you especially if business is not flowing well, and cash flow is poor; but it a mistake to nurture this thought too long because it will take you away from job 1; which is to get clients who pay you for your talent as a Real Estate Professional Not as an Administrative expert. Yes do what you have to do when times are tough, but always return to your most important task: Getting clients, taking care of clients, Keeping clients, and continually growing your client base." "Expertise is driven by Knowledge and Experience, and Home Buyers and Sellers not only desire it, they seek it and respect it from Real Estate Professionals. The ingredient of Expertise when combined with Prospecting and the determination to ask for the Sale, builds long term success and thriving Real Estate Careers. Never stop improving your Real Estate Expertise or Prospecting." "Are you aware that you are a ’Noticing’ machine? in essence you are wired to ‘Notice’ that which happens around you. Well this is the same mechanism as your ability to visualize and paint things before they happen; if you can see yourself doing it you will get closer to being it. Results are driven mainly by repeated processes but it is conscious visualization that opens your mind to the desire, passion, and the necessary work and sacrifice of success." "Your Real Estate Career does not thrive because there are homes out there; your career exists because there are customers, people who either own properties and wish to part with them or buyers who wish to acquire said properties. Of course this is obvious to all Real Estate Professionals but some agents forget the customer and pour their energies on the physical Properties. Your most important business operation in Real Estate is getting customers – therefore you are to block some of your time toward prospecting (preferably daily) no matter what the season, rain or shine, new or experienced – you prospect to connect with the people behind the transaction; your customers." "Your financial net worth lives on one side of the ledger and your debt never goes down unless you keep your eye on it; – think of this way: The Median Net Worth of US Households dropped nearly 40% from 2007 to 2010 (from a median of $126,400 to $77,200.) Remember your assets will fluctuate based on market value but your debt can only rise. Budget your expenses and track them on a monthly basis; many Real Estate Professionals keep charging to their credit card and have recurring billing for things they don’t even use. This mounting Debt will eat up your hard work if you don’t tame it." "The moment all of your choices are reasonable and in the realm of the possible you have relegated yourself to being average; and there is nothing wrong with that. The challenge you will face is that Real Estate is an entrepreneurial endeavor and standing still may cause you to be ran over. Choose to force yourself to push the layer of comfortableness and reasonableness and be ok with doing some impossible things." "There is a Business Trap that many fall into without realizing; it is the thinking that the ‘game’ should not have changed and the old of rules of doing business should still apply. You know all the ways you used to acquire new clients don’t work as easily; the way banks process mortgages or handle Short Sales, they keep changing the rules; the emails that you used to send and get instant clients are not returning as many Yes’s; the fabulous website which 2 years ago brought hundreds of leads is now down to dozens; etc… I am sure I can go on, but each one of you has had that feeling that as soon as you’ve learned how to earn a living in Real Estate the game changes. Fact is the game shall continue to continue, the ideas you learn today about generating leads on the internet will have to be reviewed, altered, and adapted to new ways of doing business as the time flows. There is only you that will transcend this fear of being left behind: adopt a way of thinking that makes you intellectually curious; surround yourself with active and go-getters colleagues; work on your thinking and look at the world as it is; don’t be afraid of hard work and to offer more to your clients; and finally prospect, prospect, prospect – you are not in the transaction business, you are in the ‘getting’ business." "The demands of the Real Estate Business are not appreciated by many, but it is a career you have chosen to love and excel at. This saying by William James may be a good companion to you from time to time: ‘The Greatest Weapon against Stress is our ability to choose one Thought over Another.’ Don’t let Stress consume your day and force you to start hating what you love." "Many do not control their daily activities and so are driven to be consumed by what has yet to be done; they become beholden to unfinished tasks. The unfortunate part these are wonderful hard working professionals. This lack of ‘grounded activities’ saps opportunity for ‘Grand Thinking’ to occur in their existence. Try this experiment for 30 days: Wake up fifteen minutes earlier and use that time to do nothing except to write down 4 to 5 items on your task list that you will accomplish; don’t keep them in your head; actually write these few tasks down and at the end of the day check off the ones you completed. Remember: I did not say write all of your tasks; I said take fifteen to reflect and put down 4 to 5 tasks and then go about running your day as normal. Try it for 30 Days." "Imitation is natural to all that we do; think about the way we learn, most of it is through imitation and repetition. Yet many choose to imitate weakness rather than strength. Surround yourself with strong and respectable people and you shall have success rub off on you; and soon you shall rub your success on those you care about!" "One of the most important habits many Real Estate Professionals fail to develop is a ‘weekly review’ of activities. The bad habit they acquire is to rely on the illusion that they will remember everything, and start using their creative brain as a storage cabinet. A Weekly Review, best done Friday afternoons, allows you in essence to perform a brain dump; you come in touch with all the promises you have yet to fulfill and catch them early; it clears the slate for your upcoming week; it forces you to think about activities focused on Prospecting; but most importantly it frees your creativity so you can think about important business ideas." "Many anticipate the negative and end up getting exactly the negative they feared; energy flows to what we fear or what we seek – how about starting to anticipate good things from those you come in contact with. I am not saying be Pollyanna about your existence and your business; but why not expect good things to come rather than to fear bad things to rain on you; after all you are in control of the anticipating part." "Ted Williams, the Hall of Fame baseball play, was know for his amazing skills and when asked how come hitting came so naturally to him he answered: ‘Well that’s simple, I take 1,000 swings a day.’ Skill is a must in order to succeed in Real Estate; it can only be enhanced and turned into excellence by actual practice. Find your daily 1,000 swings of Real Estate and your business will flourish." "Not all thinking is productive, in fact what some call ‘Thinking’ is really in essence ‘Worrying.’ Thinking that focuses on analyzing strategies, growing your business, prospecting, and generating business requires energy and focus; and your time is well spent on such tasks. What gets in the way of this creative thinking process is usually worrying about things you cannot control; let them be or journal them, but find a way to free yourself from these nagging worries." "When you have a talent, especially one that serves you well in business you must nurture it. These innate talents are taken for granted by many of us, and the price we pay is to weaken them over time. You have to improve your talents by putting them to use and practice, practice, practice… Your talents are the starting point of your excellence, Not an excuse not to work hard at your vision." "Being an Entrepreneur is hard but if you choose a career in Real Estate you have chosen to be interacted with as a Business Owner; Not as an employee. You will know that you have chosen poorly if you find yourself regularly waking up with that strange feeling that you do not want to go to work; it may seem contradictory, but these feelings are telling you that you are lacking the security of a paycheck; and, unfortunately, entrepreneurs are not handed paychecks on Fridays." "The moment you get embroiled into resolving conflicts using email you will fail no matter what your intentions are... Do everything you can to get others to interact with you verbally; once people start talking, and can hear each other intonations, they realize they are closer in intention and resolution. The vacuum of email resolution creates misunderstanding, aggravation, and negative escalation."